Jim’s Mowing has held a longstanding reputation as Melbourne, and Australia’s, most reliable commercial gardening services provider. Since 1982, Jim’s Mowing has been visiting the properties of Australia, ensuring that their gardens are healthy and aesthetically lush. Jim’s Mowing provides a commercial garden maintenance service that caters to real estate agents and commercial properties. As real estate agents are involved in property management, is is imperative that you enlist the services of a trusted and efficient commercial garden team. A full garden maintenance and lawn mowing service is designed to meet your landlord’s requirements on a consistent, or one-off, basis. Jim’s Mowing understands the vital nature that impeccable customer service and presentation have in succeeding in business. Therefore, we are more than happy to help you develop a consistent, highly effective lawn and garden maintenance service that is tailored to exceed your requirements. Operating in Melbourne’s eastern suburbs, our team of highly skilled and experienced gardeners will be happy to come out to your commercial property and develop a stunning yard. We will take care of necessary requirements to ensure that the property is stylish, healthy, colourful and most of all, ready for inspection. Lawn Mowing: Jim’s Mowing carries its name because we are the best in the business. We will produce the most outstanding finish for your lawns including their edgings. Garden Maintenance and Care: Pest and weed control, irrigation system installation and repairs, trimming and hedging, mulching, lawn restoration and repair, drought tolerant gardens, general garden clean up and more are available from the team at Jim’s Mowing. Rubbish Removal: The team at Jim’s Mowing will take care of all your rubbish removal work, including hard and green waste. 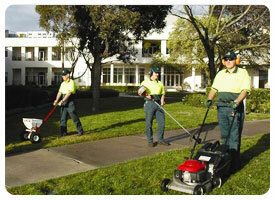 It is a highly cost-efficient solution for all your commercial garden clean up requirements. At Jim’s Mowing, we have a profound understanding of your customer service requirements, as well as safety and public health requirements. We will undertake our duties in a manner that suits all of these needs and provide our service outside of normal business hours. So, are you a real estate agents or commercial property landlord in the eastern suburbs of Melbourne and looking for a trusted commercial garden services provider? If so, don’t look any further than the legendary Jim’s Mowing name. We are committed to providing commercial property owners with an exceptional standard of service and communication, and will be happy to assist you with your enquiries or book your property in for a maintenance service at a time that is most suitable for you. Call us on 131 546 or submit an enquiry form on our “request a quote” page. We will get back to you as soon as we possibly can and with all the information you require regarding your eastern suburbs commercial maintenance service.